Sunday night's NBC face-off between Hillary Clinton and Bernie Sanders was watched by 10.2 million viewers, making it the most-watched Democratic primary debate since October. The ratings were an improvement over the other two Democratic debates on broadcast networks this election season. 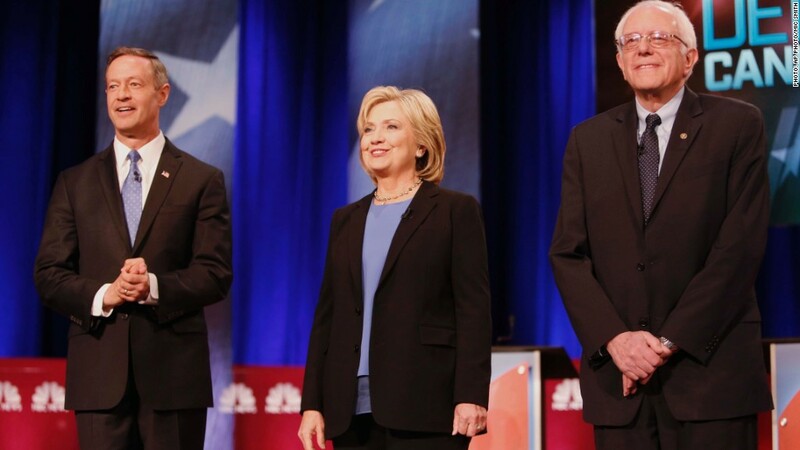 CBS's Democratic debate on a Saturday night in November averaged 8.5 million viewers. The ABC debate on the Saturday before Christmas in December had 7.8 million. NBC had an advantage over ABC and CBS, since Sunday nights have heavier TV viewership. Still, NBC's debate -- the fourth of the Democratic cycle -- didn't come close to matching the first one, televised by CNN in October. That debate, held on a Tuesday night, had 15.3 million viewers. It remains the highest-rated Democratic primary match-up in TV history. NBC said another 550,000 people watched its debate through a rebroadcast on MSNBC later in the evening. Some critics have accused the Democratic National Committee of trying to limit primary debates and limit viewership by holding them at inopportune times. NBC's debate, for instance, was held in the middle of a three day holiday weekend. With that in mind, the ratings were still relatively strong. But there's clearly still a ratings gap between the Democrats and the Republicans. The Fox Business Network's GOP primary debate last week -- with Donald Trump at center stage -- averaged 11 million viewers. That was the lowest-rated GOP debate of the season, but it still outperformed NBC's Democratic debate. On Sunday night Clinton and Sanders were joined on stage by Martin O'Malley. Despite several attempts to win more time from the moderators, O'Malley spoke for half as many minutes as his higher-polling rivals. NBC moderator Lester Holt received generally positive reviews for his performance. He was joined by questioner Andrea Mitchell as well as several YouTube users who submitted questions ahead of time via video. Some Twitter critics dismissed the YouTube integration as ineffective. It did help NBC to reach an online audience, however. YouTube and its parent, Google (GOOGL), promoted a live-stream of the debate on Sunday night. At one point the YouTube stream had more than 350,000 people watching simultaneously. NBC also live-streamed the debate on its own web site. The network did not provide any comparable streaming viewership data on Monday. This election season, the debates on cable news have generally out-rated debates on broadcast networks, despite the historic advantages of broadcast.